"There are Christians who always talk in glorious terms of their past faithfulness to Christ. Unfortunately, these same Christians do not have much to share about their present experience with Christ. Their religion is nominal, lacking the true religion of the heart and genuine commitment to the gospel." Good morning, friends. Welcome once again to Sabbath School Study Hour here at the Granite Bay Seventh-day Adventist Church. I'd like to welcome our online members and our friends who are joining us across the country and around the world through social media, the various television networks, also our regular church members, and those who are visiting with us right here at the Granite Bay church, very warm welcome to all of you, glad to see you here today. Now as many of you know, we started our brand new series dealing with the book of Revelation, our lesson quarterly, looking at some very important themes in the last book of the Bible. Today, we're on lesson number three, and very interesting and important study. And we're gonna actually share a little more about that in just a few moments before we launch into our lesson for today. But at this time, I'd like to invite our song leaders to come forward, and they'll be bringing us our special music this morning, and then we'll follow through with prayer and our lesson. Thank you so much for singing with us. And at this time, Pastor Ross will have our opening prayer. Dear Father in Heaven, once again, we are grateful to be able to open up Your Word and study this very important book, the book of Revelation, so many important lessons and truths especially for us, living so close to the second coming of Jesus. So we ask once again for your Holy Spirit to come and guide our hearts, our minds. In Jesus' Name, amen. As mentioned little earlier, we are studying through the book of Revelation. Today, we find ourselves on lesson number three. And for those of you who are following along, the lesson is entitled, "Jesus' messages to the seven churches," lesson number three in our lesson quarterly. For those who might not have a copy of today's lesson, you can download a copy for free at the following website, just lesson.aftv.org, and you can study along with us. We also have the free offer for our friends in North America, we'll be happy to send this book to you for free. All you'll need to do is give us a call. The number to call is 866-788-3966 and you can ask for offer number 191. 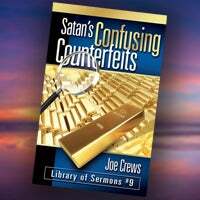 The book is entitled "satan's confusing counterfeits," just a very important study. For those outside of North America, you can download the book for free. All you have to do is simply text the number 40544 and you want to text the code "sh053." And if you're in North America and would prefer digital copy of the lesson, you're welcome to order the book, you're welcome to also text again that number, you'll see in on your screen, and we'll be happy to send this to you. Well, at this time, Pastor Doug Batchelor is gonna bring us our lesson dealing with the seven churches. I'm doing a little bit of review. I think it was Pastor Ross taught the lesson last week. And he touched on the church of ephesus. But I thought, you know, sort of be sad to have a lesson that deals with the other six churches and leave out the first one so that you could sort of have a study that would encompass them all. So we'll do a little review in just a moment. Remember, Revelation is a kaleidoscope of the entire Bible. You have just these vignettes of sevens. You've got the seven churches, the seven seals, the seven trumpets, the seven plagues. Now those are events. What does the number seven typically mean? I hear completion, I hear perfect. Where do you first find seven in the Bible? Genesis. And what's it related to, seven in Genesis related to what? Creation. Creation. It's a perfect cycle of time. Now keep that in mind because the sevens we're going to study in Revelation, the seven churches are really a religious history of the church between the first coming and the second coming. How do we know that? It said, "for the time is come to pass." In other words, the beginning of these things is happening now. Then you've got the seven seals. That, sort of, gives us a political outline of the church between the first coming and the second coming. Then you have the seven trumpets. Who knows what that is? Yeah. Well, the trumpets, usually they blow the trumpet during the time of war. And so you've got the military history of the church between the first coming and the second coming. Then when you get to the seven plagues, it's really dealing with the seven plagues from the close of probation until the second coming. But they're all dealing with cycles of time. We believe, what, they call the historicist's view of Revelation. Revelation is giving a panorama. The first ones who began to look at the seven churches that they were a historical overview, go all the way back to irenaeus and tertullian and some of the very early church fathers wondered if John was trying to tell us something about a panorama. I think you'll find it interesting as they go through the seven churches... Let me read them for you and then when you see it, you'll understand. You got ephesus, smyrna, pergamum or pergAmos, thyatira, sardis, philadelphia, laodicea. Each of the churches are given in order as you would be doing a mail route around asia. And so I think it's very interesting, it's almost like when the vision is given, they're looking from the sky down, and they see the seven churches outlined there. Each of the names means something. All the names in Revelation have a meaning. Ephesus means desirable. Smyrna, it's even composed in the name, means myrrh. It's the persecuted church. Ephesus is the loveless church. PergAmos means height or elevation, it's the tolerant church. Thyatira means high tower, it's the compromising church. Sardis means prince of joy, it's the nominal church, a church in name only, you have a name but you're dead. Philadelphia, we got a city name philadelphia. Phileo is one of the words for love, phileo love. Philadelphia is the city of brotherly love. And it's one of the positive churches. And then you got laodicea, that means a judging of the people and it is the arrogant or the self sufficient church, and we're living in that age of the church now. And so you can track this in covering… it shows what was happening in these churches during these periods of time. Now the seven churches are not written just to a certain church in a certain age. The seven churches represent a cycle that a church may go through. Starts out like ephesus, it's on fire but it loses its first love and goes through all different iterations of a church and ends up like the church of laodicea. You might go to a town where you visit different churches and you could say, "well, this church is like the brotherly love church." And you go to another church up the street and you say, "this is church is Lukewarm." And you can go to another church and say, "this church is a church in name only." So keep in mind, those seven messages to the seven churches... There it is. Thank you. You can see up on the screen here. You've got patmos where the vision was written from, and it's almost as the Lord is taking John on a journey. He goes up to sAmos and it begins the mail route, starting with ephesus, smyrna, pergAmos or pergamum, thyatira, sardis, philadelphia, laodicea. It's kind of like circling. Now why these churches, were these the biggest churches in Christianity when the letter was written? No. They were bigger churches in rome, alexandria, antioch, lot of bigger churches. So right away, you know, there's something fishy going on that there's some prophetic meaning happening here because he picks just churches in asia and he gives a different message to each one. It seems like there's no two alike because they really represent the history, the Spiritual history of the church it was about to go through. Jesus said, "the time is at hand. I'm sending, and I'm signifying this message to you in signs and symbols. All right. Well, with that, let's dive in. I'm gonna do a little review and talk about the church of ephesus in starting. It covers a period of approximately 30 a.
d. To 100 a.d. And if you read in chapter 2 verse 1, "to the angel of the church of ephesus write, 'these things says he who holds the seven stars in his right hand…'" are the churches getting ready to go through a difficult time? What do the stars represent? He tells us later, the dragons thrown out of heaven and he draws third of the stars to earth with him. Who are those stars? Angels. Angels, good or bad? Follow the dragon, they're bad angels, but our stars sometimes good angels. So when it says, "unto the angel of the church of ephesus, unto the angel of the church of pergAmos…" was there like a particular angel? You've got a guardian angel, those churches had guardian angels. What does the word angel, angelos mean? Messenger. We talk about, in our church, the importance of the three angels' messages. So those angels are symbolic of messages that are to be given. And so, here you've got the angel's messages, it's talking about, "unto the angel of the church of ephesus.
" It means the message to the church of ephesus, just like you got first angel, second angel, third angel giving messages, you've got another fourth angel on Revelation 18 giving a message. These are the messages of God to these churches, okay? "These things says he who holds the seven stars in his right hand…" I've got the message of the church in my right hand, the hand of favor, "who walks in the midst of the seven golden lampstands…" so church is to be a light in the world, Jesus said, "set your light on a hill." He says, "I know your works, your labor, your patience, and that you cannot bear those who are evil. And you have tested those who say they are apostles and are not." This is the first day to the church. If I told you, my name was apostle Batchelor, would that make you nervous? Do we still have deacons in the church? We still have pastors, we still have evangelists, any apostles? If you're mormon, you say, "yes, there's still apostles." Typically we see that the apostles sort of died out in the first century. The apostles' qualification, for me an apostle, is he really had to be someone who had a personal encounter with Jesus. You either walk with Jesus. When they chose someone to replace Judas, what was the criteria? Acts chapter 1, those who'd follow Jesus, they knew Jesus, they had a personal relationship. The only reason Paul gets to qualify as an apostle, he personally met Jesus, didn't he? And so they hesitated using the term apostle after that time. So this is telling, this is talking about the first age of the church from about 30 to 100 a.d., Which is when the last of the apostles died, the apostle John. "You've tested them and you've found them to be liars, and you have persevered and have patience, and you've labored for my name's sake and you've not become weary. Nevertheless I have this against you, that you have left your first love." Now have they left off all love or is it saying that their love had diminished? Does that sometimes happen with Christianity? How many of you have noticed when a person first learns the truth and their sins are forgiven and they get that new life and they've got that joy, and what's the Spirit? They've got that first love, they're on fire, they love the Lord, they want to go everywhere and do anything for Jesus, right? But then as time goes by, it can start becoming routine, and they can lose the first love. Does that just happen in churches or can it happen in a marriage, after the honeymoon is over? Now, he's not condemning them that they have no love. What does Jesus say is a condition of the church in the last days? The love of many will grow cold. Does he give a formula here how to restore that first love? Let's read it. "Remember therefore from whence you have fallen…" he says they are to remember, to repent and to repeat. "Remember from where you have fallen, repent and do the first works. Repent of your sins and do the first works, repeat what you did at the beginning or else I will come to you quickly and remove your lampstand from its place, unless you repent." Now this is a very important bit of theology. I hope I can get through this lesson. There's just so much to cover. Do some churches teach that if you're a Christian and if you're saved, you can't be lost? Whose Jesus message to the church of ephesus to, isn't it to Christians? Does he say it's possible for Christians to have their lampstand removed, to have their name taken out of the book of life in the later church? He gives warnings to every church age saying, "don't lose what you have because you can lose eternal life.
" Paul says, "if I preach to others and I'm cast away." Paul even recognized he could be cast away. And so the idea that once you're saved, you can't be lost, that's a doctrine of devil. It gives people a false security, it is not biblical all the way from Genesis to Revelation. It's pretty clear, your relationship with the Lord must be maintained. Once you come to Jesus, you can have assurance of salvation, but you shouldn't be presumptuous and say, "I can never lose it if I deliberately choose to neglect my relationship.
" You can't, you don't lose your freedom after you become a Christian. You still have your freedom of choice. So he says, "repent or I'll take your candlestick out of its place. But this you have…" you noticed, he commends them again, "in that you hate the deed of the nicolaitans…" you'll also find that nicolaitans appear later, "which thing I hate." All right, as you go through Revelation, remember this. Numbers have real value, names are all symbolic. That's simple lesson I got from dr. Leslie hardin has helped me. The names in Revelation are symbolic. When it talks about jezebel in Revelation, is it talking about literal jezebel or who she represented in the old testament? When it talks about balaam, was balaam resurrected, or does it mean people had the Spirit of balaam? When it talks about Egypt and sodom, sodom is no more, Egypt had fallen. It's talking about the attitudes of those places. So when it talks about the nicolaitans, what does the name mean? All the names of the churches have meanings as well. Nicolaitans, it was a group of people who were... They were very carnal Christians. They believe, since you worship God with your spirit, what you do with your flesh doesn't matter. Some traced it back to nicolas of antioch, one of the first deacons who apostatized, but there's really no biblical record that he did that. They tried to get maybe credibility by attaching their practice with his name. They were sharing vibes, they were living for their stomachs, the very name nicolas meant, let's eat now. So you're gonna find they talk about Christians that were carnal Christians and then they were greedy, materialistic Christians, the balaam Christians. And do we have those in the church today? Yeah, so the doctrine of the nicolaitans and the doctrine of balaam, those things are still in the church today. All right. And then he gives a promise. He says, "I commend you that you hate the doctrine of the nicolaitans which I also hate." Their teachings that Jesus hates. "He that has an ear, let him hear what the Spirit says to the church." He says that frequently. "To him who overcomes…" now how many times does Jesus say that? Seven times. How many churches were called to repent? Six. Five. Two of the churches are good. Smyrna was persecuted, and philadelphia. All of the churches are encouraged to overcome. So the church in every age is told, "you can be overcomers.
" What is it we're trying to overcome? Selfishness, sin, and satan. We all struggle with those things, right? And usually one leads to the other. He says, but through Christ, how much can I do through Christ? All things. All right. And then he makes a promise, "to him that overcomes, I will give to eat from the tree that is in the midst of the paradise of God.
" Tree of Life is mentioned six times in the Bible, three times in Genesis and three times in Revelation. We lose it in Genesis, we get it back in Revelation. Amen? Amen. Next church, "unto the angel of the church..." Oh, now wait. I want someone to read something to me first. I want you to notice that the church in the first age, the church of ephesus is the church on fire, they're in love with the Lord, the Gospel was going like gangbusters. But then as it become established, they lose their first love. For instance, you read... Now someone's gonna Colossians 1:23, we'll have that one. I don't know, did they give that to somebody? Just a moment, and before you read that, I'm gonna read Colossians 1:5, "because of the hope which is laid up for you in heaven, of which you have heard before in the word of truth of the Gospel, which has come to you, as it has also in all the world.
" Because of that first love they have, how far had the Gospel gone in one generation? It had gone to the then known civilized world. They've gone everywhere preaching the Gospel. Now does that mean when it says all the world, they went to south America? No. Does it mean they went to australia and china? Probably not. They're talking about, they're using the word as it's called. .. It's not an experlative. Trying to find that, what the technical term is sometimes. Well, it's left me. But, yeah, he's using a metaphor, saying, going into all the world. All right, go ahead, read your verse for us, Colossians 1:23. "If indeed you continue in the faith, grounded and steadfast, and are not moved away from the hope of the Gospel which you heard, which was preached to every creature under heaven, of which i, Paul, became a minister." Preached to every creature, already! Look at what they're saying, that the Gospel is gone to all the world, to every creature. And so this is the church in the first age of ephesus. Next, you get to the church of smyrna in pergamum or pergAmos. That covers an age of about 100 to 538 for the church of smyrna. And, let's go ahead and read that together. This is a persecuted church. "Unto the angel of the church…" actually, yeah, I think smyrna is from 100 to 313. "Unto the angel of the church in smyrna write: 'these things says the first and the last, who is dead and he came to life.'" Now why is he saying that to this church? This is a church they are offering themselves as a sacrifice. After the first century, from the time of nero, they began to declare Christianity religio illicita, forbidden religion. Christians went underground. They started digging the catacombs. They were persecuted. They were dying for their faith. They were being told if they do not burn incense and sacrifice to the various idols, they could be fed to the lions, they would be tortured, they had their possessions taken away. That's why Paul is saying it might be better not to marry and start a family during this time of persecution that was beginning with Paul. Paul was beheaded by nero. Peter was crucified upside down. But it really intensified during the time of the emperor diocletian, and we'll talk about that just a minute. "These things says the first and the last, who is dead and came to life, 'I know your works, your tribulation, and your poverty but you are rich…'" they'd lost all their possessions for the Gospel. He says, "I died but I'm alive, don't be discouraged. I know the blasphemy of those who say they are jews and are not, but are of the synagogue of satan." Some were claiming to be Christians, but they were selling out. Now are there people today that say they're Christians and they live like the devil? So we still have the synagogue of satan today, don't we? "Do not fear any of those things that you are about to suffer. Indeed," he says, "I'm telling you in advance, the devil is about to throw some of you into prison, and you may be tested, and you will have tribulation ten days." There was an especially intense tribulation that took place between 303 and 313. Now what is the day equal in biblical prophecy? One day is one year. So he said, you're gonna have tribulation ten days. Do you really think that Jesus would warn them about ten days of tribulation or was it ten years? This is another verse that proves a day equals a year. And you see it historically, there was an effort made to eradicate, annihilate, completely destroy Christianity, and this emperor actually, I think had coin stamp that says, "I destroy the Christians," he'd optimism of that, but he did not. But there was a fierce persecution. I think it was the church father tertullian that said, "the blood of the martyrs is seed, and the more that you try to kill off the Christians, the more they grew.
" And so it spread. And Jesus tells them, "be faithful unto death, and I will give you the crown of life." Notice he doesn't reprove them for anything, no repentance here. "He that has an ear, let him hear what the Spirit says to the church. He who overcomes will not be hurt by the second death." Notice, there are three or four references to death and resurrection in this one message to this one church. Why did they need that? They're being killed for their faith. This is the age of the church and smyrna, myrrh, is a fragrance, that's an incense, and that's almost like God is saying, "your sacrifice of your lives is coming up before me as a sweet smelling savor." This is a church that lived during age of total sacrifice. They put everything on the altar for Jesus during this time. And so that's the church of smyrna. It lasted too, as I said, about from 303 to 313. And then you get to the church of pergAmos which comes next. And it says, "unto the angel... This is verse 12. I'm in Revelation 2:12, "unto the angel of the church in pergAmos write: 'these things says he who has the sharp two-edged sword." Now what is that two-edged sword represent? The Word of God is quick and powerful and sharper than any two-edged sword. Does Jesus appear in Revelation with a sword coming out of his mouth? And so it's talking about the Word of God. "I know your works, and where you dwell, where satan's throne is.
" Now, where is satan's throne? It talks about... Yeah, it's here on earth but was there a place that he was especially enthroned? Does it talk later in Revelation about the beast receives its throne and its power? Does it talk about a woman who reigns over the Kings of the earth? Where did she reign? In all those cases, it's talking about rome. Rome was where the power was, and rome became the seat of corruption. Rome is where Paul was killed, Peter was killed. The seat of caesar who was fighting to annihilate Christianity but the church in rome, aren't we thankful for the book of Romans? The church in rome was doing their best to maintain faithfulness. Now what happened is following the persecution of the church of smyrna in about 320, along came an emperor by the name of constantine, and, many of you know this, but I probably got to repeat it that they had enemies coming in from the north. He felt, "why are we spending all our energy fighting the Christians, Christians really aren't hurting anybody." And he said that... His mother converted to Christianity, it even reached the palace. And he claimed that he had a vision of Christ telling him to conquer under the sign of the cross. And constantine ordered his army to March through the tiber river, and he said, "you will all thus be baptized.
" He only had a superficial knowledge of Christianity, he knew they got baptized, he didn't realized you needed to be taught the teachings first. So all of these soldiers suddenly said, "I guess I'm a Christian because the emperor says I'm a Christian." It sort of became a government church, then it became fashionable. Everybody wanted to be a Christian because the emperor's mother is a Christian and now it's accepted, and suddenly, it became a fad, everyone wanted to be a Christian. And saying you're a Christian is like, "I'm a Christian." And it became really cool, and they had a name. And so notice what happens here. "You're located where satan's throne is and you hold fast to my name, and you did not deny my faith even in the days in when antipas was my faithful martyr." Antipas means against pas, against The Father. They started, the church fathers began to compromise, and those who stood up against the church fathers were persecuted. It's even during this time you have the birth of the waldenses named after Peter waldo who said, he was willing to forsake everything, go out and teach. "And you have those there who have the doctrine of balaam, who taught balak to put a stumbling block before the children of Israel, to eat things sacrificed to idols, and to commit sexual immorality." So there was greed coming into the church, there was compromise. You notice what balaam did. Now when you think of balaam, first, he tried to curse Israel but it didn't work. But did balaam ever succeed in getting a curse on Israel? He did. Do you remember how he did it? He wanted the rewards, he was so greedy for the rewards of balak that he went back and said, "look, having me try to utter curses on Israel is not doing them any good 'cause they're blessed, but if you get them to disobey their God, if you could get them to commit idolatry and worship your Gods, and if you get the women to go in among them and invite them to their feasts," balaam did that, it did work. The men were enticed to worship the Gods of moab and a curse and a plague fell upon them. So something was happening to the church during this age of pergAmos where compromise came in. They started to worship the pagan Gods and commit whoredom is what God calls it because when constantine legalized Christianity, rome... Someone said there were more Gods in rome than they were tiles on the roof. They had idols everywhere. And they were like pigeons, idols, hundreds of thousands of idols, there are all these different Gods. And the funny thing was you can worship almost any God in rome except jehovah, that was against the law. Constantine said, "that's silly. Let's just allow jehovah worship." So all these people suddenly became Christians, but the priests didn't want to lose their jobs. So the priests converted and they brought their robes and their ceremonies into the church, the pagan ceremonies have began to comingle. They didn't want to get rid of their beautiful works of art, the idols, and they said, "well, let's give them Christian names." So all over the Kingdom, they just started to kind of rebaptize the idols and call them Peter, James, John, and mary was everywhere. But it formally had been athena or semiramis or one of these other female deities and they just named her mary. She's usually got a sun just behind her head, and they even had tammuz. These pagan Gods were holding the baby which was tammuz, that's why you often see pictures of mary holding the baby Jesus. The comingling of truth and error came in, and this is what balaam had done. He got them to commit harlotry. You know, when God's people turn to idols, what did you call it biblically? They called it harlotry. So this is the church of pergAmos and a great compromise there. You know, we go on next to the church of thyatira, and you read about this here, and it starts in Revelation 2:18. "And unto the angel of the church," he says, "here's really the message to the church of thyatira write: 'these things says The Son of God, who has eyes like a flame of fire," I see everything, "and his feet like fine brass. 'I know your works, your love, your service, faith, your patience. And as for your works, the last are more than the first.
" They are doing a lot of good works. "Nevertheless I have something against you, because you have... Nevertheless I have something against you because you have allowed that woman jezebel, who calls herself a prophetess, to teach and seduce my servants to commit sexual immorality and to eat things sacrificed to idols. And I gave her time to repent of her sexual immorality, and she did not repent. And indeed I will cast her into a sickbed, and those who commit adultery with her.
" This is, if you want to know who is thyatira, thyatira is the woman of Revelation 17, jezebel. It's a woman who persecutes the prophets. Now God still had a faithful church during that time, but they had to go back underground again because now the church had become so powerful that she was persecuting and enticing the faithful to compromise. And so this is a time really when the church in rome was growing and spreading everywhere. There were still good people doing many faithful works, they still believed in sacrificing, giving. And the Lord saw that. But I tell you, even in the... You know, you really need to commend the zeal and the dedication of the catholic church during this age because they had orphanages, and monasteries, and missionaries that were getting killed, going out, and hospitals that they were building. Only hospitals were run by the church. There are a lot of dedicated people like mother teresa doing wonderful works, and God sees that. But he said, when it came to their biblical faith, they were getting a long way from the Bible, and it was turning to harlotry, and the church had become corrupt. What does the woman represent? So you got jezebel. So this is the church during the age of jezebel. And I'll read on here, it said, "indeed I will cast her into a sickbed, and those who commit adultery with her into great tribulation." During this time, you had the bubonic plague, the greatest gorge of death that went through europe. The only thing that came close was the flu of 1918. "I will kill her children with death…" they called it the black death, "and all the churches will know that I am he who searches the minds and the hearts. And I will give to each one of you according to your works." Now we're saved by grace. But you notice the term keeps coming up here in Revelation. "I know your works, I know your works, I know your works." Are we saved by works? We're saved by grace. But does God look at our works to see if our hearts are changed? Your works will be evidence of that. We're saved by grace but we're judged by... Bible says, "I'll judge everyone according to their works." "Now I say unto you, and to the rest in thyatira, as many as do not have this doctrine, who have not known the depths of satan, as they say, I'll put on you no other burden. But hold fast what you have till I come. He who overcomes, and keeps my works until the end, I will give power over the nations. 'He will rule them with a rod of iron. And they'll be dashed to pieces like the potter's vessel,' as I also have received from my father, I will give him the morning star. He that has an ear, let him hear what the Spirit says to the churches." Next, we go to the church of sardis which is the dead church. "Unto the angel of the church in sardis write these things. "These things says he that has the seven spirits and the seven stars, 'I know your works and that you have a name, you are alive, but you are dead.'" Now there are a lot of good church names out there. I like the name assembly of God. Don't we want to be in assembly of God? I like the name church of Christ. I even want to be a latter-day saint. You understand what I'm saying. I want to be a witness for jehovah, don't you? Not that, it kind of gives you... It makes you cringe a little when you hear me say that, but you know what I'm saying. There are great names out there, a lot of names. How many different church names are there out there? Thousands of them. But is it possible to have a name and nothing behind it. It's like, you know, they say back in the Texas that he's all cowboy hat and no cows. And you know, he's got the hat, he's got the boots and the spurs, and he got not horse. And so this is what's happened to the church, it's become an institution, it's lost the sprit during this time. And this is the dead church that you've got during the time of sardis. "You have a name that you're alive but you're dead. Be watchful, and strengthen the things that remain…" there's still a little life in the teachings they have, "that are ready to die. I've not found your works perfect before God. Remember therefore how you have received and heard, and hold fast and repent. Therefore if you will not watch, I will come upon you as a thief, and you will not know what hour I will come upon you. You have a few names even in sardis that have not defiled their garments…" and this is a time of the reformation, "and they shall walk with me in white, for they are worthy. He that overcomes shall be clothed in white garments, and I'll not blot his name out from the book of life." You mean, a person can have their name in the book and have it blotted out? He's talking to the church here, isn't he? "I will confess his name before my father and before his angels." This is what Jesus said. "He that is not ashamed of me in this wicked generation, I will not be ashamed of him.
" But if we are ashamed of him, he'll be ashamed of us. It's like when the Lord said to the devil, "have you considered my servant job?" Your God is confessing the name of one of his faithful servants in heaven before even the devil. "Let him that has an ear hear what the Spirit says to the church." Now you got the faithful church, the church of philadelphia. This is the church during the age of the great enlightenment, during the time of whitfield and wesley, the American Bible society, and the english Bible society, and the missionaries are being sent around the world. This is a great mission explosion. It was a church of brotherly love. They got out of their churches where there was a name and they were dead, and they started preaching in the open fields. And whitfield and wesley, they went and did mission work in North America, and is when carey went into india. And I think, it's when judson went to china during that same age. So you get the great missionary zeal taking place during this time. "These things says he that is holy," I'm in Revelation 3:7, "he is true, 'he who has the key of David, he opens and no one shuts, and he shuts and no one opens.'" What does that mean? Someone gonna read for me Isaiah 22:22. Who's got that one? And what does Jesus mean by saying, "I've set before you an open door. I've got a key." Okay, go ahead and read that for us. Isaiah 22:22, "the key of the house of David I will lay on his shoulder, so he shall open, and no one shall shut, and he shall shut, and no one shall open." This is a verse that's being almost directly quoted in Revelation. You remember what we said a couple of weeks ago on our introduction, that out of the 404 verses in Revelation, 278 are almost found word for word somewhere else in the Bible. And so, who is it that has... Who is The Son of David that has a key? That's Jesus that is The Son of David. And what is the door he opens? Well, for one thing, it's a door of salvation that he opens before us. And the keys... Then he tell the disciples, "I give to you the key of the Kingdom.
" Does that mean that the priests are the ones who decide you're saved or is the key in the truth? In sharing the Gospel, you have the keys of eternal life. And so as we share this, the word with others, the door is open. "For you have a little strength and that you have kept my word and not denied my name. Indeed, I will make those who are of the synagogue of satan who say they are jews but are not, I'll make them come and worship before your feet to know that you have loved me because you have kept my commandment. To persevere, I will also keep you from the hour of trial that will come upon the whole world.
" You know what? It was some of the puritans and some of these who were reviving, like I said, the wesleys in the whitfields. They believed in religious freedom, the church of england, and the other church in rome, they were terribly persecuting them for what they were doing. But eventually, they embraced, europe and America embraced religious freedom, and the proclamation of the Gospel. So they came and recognized that God was with them. "Because you have kept my command to persevere, I'll keep you from the hour of trial that will come upon the whole world to test those who dwell on the earth. Behold, I'm coming quickly." We're about to get to the church of laodicea. "Hold fast what you have that no one may take your crown." Again, is it possible to lose your crown? It says, you Christians need to maintain, hold fast. "He who overcomes, I'll make him a pillar in the temple of my God. And he showed..." David says, "I'd rather be a gatekeeper in the house of God." He'll go out no more, and I'll write on him the name of my God, and the name of the city of my God, the new Jerusalem that comes down from God from my God." By the way that isn't referenced again until you get to Revelation chapter 21. "And I will write on him a new name, he that has an ear, let him hear what the Spirit says to the church.
" And now we get to the last age, the last church which is the church of what? Laodicea. And I have been giving you all of the dates. A church to philadelphia is like 1740 to 1844, the church of laodicea is from 1844 to, you would like to have that last date, wouldn't you? But no man knows the day or the hour when laodicea ends. Not too far away. If you got someone telling you, they know it, watch out. Now 1844 is a very interesting year. A lot of things happened. Not only was it the ending of that great advent proclamation, it's the time where you had the great disappointment. The first digital message ever given was in 1844. How many digital messages do you get today? First electronic message, you know, what the message was? Robert morse, who invented morse code, the message was, "what hath God wrought.
" He quoted the Scripture from Numbers, what hath God wrought. That was the year where you have the birth of communism in karl marx communist manifesto. It was during that year that darwin formed his theory of evolution during his voyage on the beagle. So many things happened, it's a very interesting year. So that's kind of the end of the age of philadelphia, now you get the birth of the church of laodicea. A lot of the churches have rejected that message of Jesus' coming, the advent message, they went to sleep. They pressed the snooze button. Obviously, he didn't come. And then they began to believe their reach increased for good. So let's read what it says here about this church. "To the angel of the church of the laodiceans," right, by the way, we enter the time of judgment, what is the word laodicea mean? A judging of the people. "These things says the amen, the faithful and true witness, the beginning of the creation of God." Now when do you say amen? It's often at the end of a prayer. Christ is getting ready to come. These things says the amen, the beginning of the creation of God. "I know your works that you are…'" what I want to say is the beginning of the creation means all creation began with Christ. All things that were made were made by him, it doesn't mean he was created. "I know your works, that you are neither cold or hot. I wish you were cold or hot, so then because you're Lukewarm and neither cold or hot, I will spew or vomit you out of my mouth." Now just a little side note, laodicea was very prosperous city. And they were so rich that when they suffered from an earthquake, rome offered to send the money to rebuild them. They said, "we don't need your money, we got our own.
" How often would you turn down government money? They were that rich, and arrogant, and self sufficient. They didn't have a good water supply from the city, so they had to build an aqueduct that brought the water. They had water, cold water springs to the south. By the time it got to the city, it was Lukewarm. And they had the hot springs six miles to the north, but didn't reach the city hot, the water all came Lukewarm, and sitting in the sun, and in these channels of the aqueduct, sometimes the water got stagnant because it didn't run very fast. And if you drink warm stagnant water with moss in the summer, you could get sick. And so some people, in spite of the riches, they got sick from drinking the tepid water. If you boil water, it's good, if it's cold and running, it's usually safe. But if it's Lukewarm, it can make you sick. And so, someone would say, "why would Jesus say, 'I wish you were hot or cold.
'" Now let's suppose hot means you're full of zeal, you're on fire for the Lord, you're out preaching, you're teaching, you're sharing your faith, you're praying. We can all understand why God would say, "I wish that you were hot, zealous." But why would Jesus ever say "or cold?" What does cold mean? Cold, was that mean, dead, indifferent lost? No, not exactly. Cold would represent a person who is humbling themselves, they know their weakness, they're asking for help, they're praying, they're in a state of repentance. the Lord can work with you even if you've fallen, but you're repenting, right? And he can work with you if you're on fire, and you're zealous, and you're full of the Spirit. He can't work with you when you think everything is okey-dokey, and as lucille ball says, it's inky stinky. You think everything's okay? But you don't know what your true condition is. This is the church that is self deceived. Notice what it says here. You do not know. This is the problem "because you say, 'I'm rich and become wealthy,' you have need of nothing, you do not know that you are wretched, and miserable, and poor, and blind, and naked.
" Now can the Lord use a person that is wretched, miserable, poor, blind, and naked? Can you come to him and be saved if you are wretched, miserable, poor, blind, and naked? I love that story in the Bible of those four lepers that are trapped outside the city, 2 Kings chapter 7. And Jesus reveals to them this great feast of food 'cause the other army fled. And God uses them to share the message. Here you've got these lepers that are poor, wretched, miserable, blind, and naked. He gives them the message of abundance, they bring the message to the city, "how could God use someone like that?" Because they surrendered. They went to surrender to the enemy. And because they came to the point of surrender, he could give them the message. You get people like mary magdalene. He uses the very least to share the message. You've got that crazy demoniac. You cannot find a more lost person in the Bible than the demoniac. I challenge you to find someone who is in worse shape than the demoniac that you read about in Mark chapter 5, Luke chapter 7, who is naked, covered with chains, covered with scars, living with the dead, surrounded by pigs, is out of his mind, is unclean, is unsocial, but he comes to Jesus. That's what he does. He comes to Jesus, and what does Jesus do? And one day he makes him an evangelist. That's a great story. So if a person realizes their need, no matter how bad off they are, the Lord's arm is not shorten that he cannot save. Isn't that good news? But what God cannot do is a person who will not humble themselves. You're in the greatest risk of committing the unpardonable sin if you're in laodicea. You're in the greatest risk of saying, "I don't need God." 'Cause God can work with almost anybody except the person that doesn't humble himself. They don't recognize their need. And so he said, "I counsel you to buy of me gold, tried in the fire, that you might be rich." And what is that gold? That's love that works by faith. "And white garments." What does clothing represent? He's offering us. It's like at the wedding feast, he offers a robe. It's the King that is giving a robe, its righteousness. "That the shame of your nakedness may not be revealed, and to anoint your eyes with eye salve.
" I understand laodicea was a place people went for this balm for their eyes, the ancient medicine they have there. It says, "look, I've got eye balm for you that you may actually see." Didn't Jesus once anoint a blind man with this mud and his eyes were open? "As many as I love, I rebuke and chasten." So don't be upset if God, if you're convicted. Praise God, if you're convicted, and you are brought to repentance. "As many as I love, I rebuke and chasten. Therefore be zealous," and hot would be zealous, "and repent.
" There's the hot and cold right there. Hot, zealous, cold, repent. If you're repenting, he can work with you. If you're on fire, he can work with you. "Behold, I stand at the door and knock.
" This is the last message to the last church called the amen, and where is he? And at the door, "I'm about to come." "If anyone hears my voice and opens the door…" now not only is he knocking, you can hear knocking, but in order to hear his voice, his voice is not the knocking, his voice is the talking. So they hear the knocking, they hear the voice, and open the door. I understand, harry anderson painted the famous picture of Jesus knocking at the door. He, Jesus is standing at this door, it's at a home, and he's knocking. It's a beautiful picture. But someone noticed that you can clearly see the door has no doorknob on the outside. It can only be open from the inside. Jesus is not going to break in to your heart, you must open the door. "I stand at the door and knock. If anyone hears my voice and opens the door, I will come into him and dine with him, and he with me.
" He says, "I want to sup with him." What did Jesus say to zacchaeus? "Come down, today I must abide at your house." I want to sup with you. I want to live with you. I want to dwell with you like he did with Lazarus and Martha in their home. I want to have a personal relationship with you. "And he with me. To him who overcomes, I will grant to sit with me on my throne." What a privilege! "As I also overcame and have sat down with my father on the throne." Is it only the 12 apostles that get to sit on 12 thrones? Or does Jesus said to the entire church of laodicea, to him that overcomes. We not only get crowns, we not only get mansions, we get thrones to live and reign with Christ is what the promise is, right? That's wonderful. When he's moving the capital of the universe to our world, and we will get to reign with him. Well, friends, that was a short and probably a pitiful overview of the seven churches. It's so hard to jump that all together in just 50 minutes or so. Thank you so much for joining us. I want to remind you that we do have a free offer. If you did not catch the beginning of our program, it's called "satan's confusing counterfeits." It talks about like the church of laodicea, and also thyatira . If you'd like a free copy of this, it's offer 191. You'll ask for that when you call 866-788-3966. That's 866-study-more or you can get it for free right now. If you want, you can download it. Just text, text the letters "sh058" to 40544, and this... The mailing of the book, of course, is for the us. God bless, we'll look forward to studying His Word together again next week. Don't forget to request today's life changing free resource. Not only can you receive this free gift in the mail, you can download a digital copy straight to your computer or mobile device. To get your digital copy of today's free gift, simply text the keyword on your screen to 40544 or visit the web address shown on your screen. And be sure to select a digital download option on the request page. It's now easier than ever for you to study God's Word with Amazing Facts wherever and whenever you want, and most important to share it with others. So what is the brightest light in the world? Well, naturally, you would say the sun. But we're talking about the brightest man-made light in the world. It's the light that shines out of the roof of that pyramid shaped hotel in las vegas called the luxor. There in the cap of that hotel, there is a room that contains 39 washing machines size xenon bulbs, and each of those bulbs requires about 7000 watts, altogether they produce about 40 billion candlepower of light. Can you imagine getting that electric bill of the luxor hotel every month? That light is so bright that planes can see it 250 miles away. They are shooting light 10 miles up into space, meaning if you happen to be floating by, you can read a newspaper up there. And as you might have guessed that bright light has become the world's best bug attractor. Bringing in moths, bats, and owls creating its own ecosystem there at night above the hotel. But the sad thing about the brightest light in the world is especially when the night air is clear without any particles, the light doesn't hit anything and it's invisible, it shoots up into empty space. The brightest light in the world illuminates nothing. You know, the Bible tells us that there's another great wasted light, and that's the light of God's Word. It says in psalm 119:105, "thy word is a lamp unto my feet and a light unto my path." And yet so many people are walking in darkness. Furthermore, Jesus said, "if you do have that light, make sure you don't put it under a bushel, but you let it shine and illuminate the lives of others. Jesus said in Matthew chapter 5, "set your light up on a hill like a city so that all might see it." Light only benefits others when it reflects off of something. God wants our lights to illuminate the lives of others. So are you glowing for God? Remember, Jesus said, "let there be light." Let's face it, it's not always easy to understand everything you read in the Bible. With over 700,000 words contained in 66 books, the Bible can generate a lot of questions. To get biblical straightforward answers, call into Bible answers live, a live nationwide call-in radio program where you can talk to Pastor Doug Batchelor and ask him your most difficult Bible questions. For times and stations in your area or to listen to answers online, visit bal.amazingfacts.org. Friends, one of the amazing things you will often find in the south pacific islands like here on fiji is the wiwi plant. Now in North America if you want to build a fence, you got to get a fencepost, and then you put the wooden fencepost in the ground, and then after few years they're gonna rot and break off unless they're specially treated. But here they got these trees, the wiwi tree, they can cut them right out of the woods, they'll take a stick, they'll stick it in the ground. And because they have so much rain and precipitation, it begins to sprout and turns into a living fencepost. It makes up its mind that it's gonna flourish wherever you stick it, which is a good lesson for you and me. So you might wonder sometimes if you've got a purpose in life. You might feel like you are growing sort of sporadically in every direction, and then along comes this person who cuts you down and carries you off, he sticks you in the ground. But you look back and you say, there was a plan, there was a purpose. God knows how to teach us how to prosper where he plants us. You might wonder why the Lord has put you where he has in life. But you can put down roots, and you can grow, and you can serve a great purpose for God. You know, it's like God says in Jeremiah chapter 29, "I know the plants that I've got for you to give you a future." God has a purpose for your life, friends. And he can help you to prosper and grow wherever you're planted.